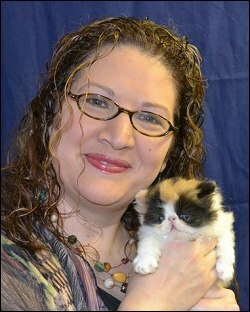 On this site, you will find information about the Breed Council itself, as well as general information about the Persian breed, articles on grooming and history, color breeding charts, and top divisional winners in CFA. Please enjoy your visit! 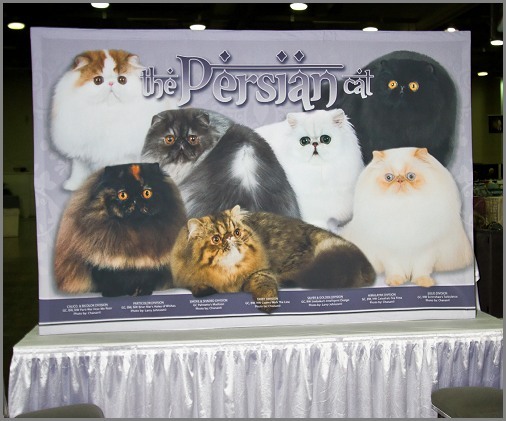 Pictured is the Persian Breed Booth, designed by Sophia Staples, which debuted at the November 2012 CFA World Show. What is a Breed Council? The CFA Breed Councils were established in 1970 to serve as an advisory body on breed standards to the CFA Executive Board. Each of the breeds recognized by CFA for championship competition has its own Breed Council and Breed Council Secretary. The CFA Breed Councils are comprised of individuals experienced in their chosen breed/division section, and who meet other eligibility requirements established by the CFA Executive Board. Each Breed Council channels opinions and suggestions from the individual breeder to the Board through the specific breed secretary, and the breed standard is updated as the breed progresses. From time to time, each breed council also updates its breed profile, a more informal introduction to the breed. How can I join the Breed Council? You must meet the requirements specified by CFA, and submit a membership application. The current Breed Council secretary for the May 2017-April 2019 term is Carissa Altschul. There are two candidates declared for Breed Council secretary for the May 2019 - April 2021 term. There is a Yahoo group set up for current breed council members only. If you are a current member, and would like to join the group, please send an e-mail to cfapersianbreedcouncilforum-subscribe@yahoogroups.com to subscribe.